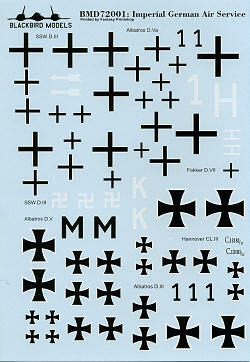 This is Blackbird Models first 1/72 scale sheet and it covers a number of aircraft of the German Air Service during WWI. Fortunately, there are kits available for all of these without having to resort to limited run or resin. The sheet itself is very nicely printed by Fantasy Print Shop. Nothing overtly colorful in the markings; the planes will provide all of that. Unless otherwise noted, the wings are in lozenge camouflage. First up is a Siemens-Shuckert D.III from 1918 with Jasta 5. Wood fuselage with green forward section and wheels. For this aircraft, the suggested kit is Toko/Eastern Express. Next is an Albatros D. III from Jasta 29. Dark Green and mauve over all the upper surfaces with light blue undersides. Roden and Eduard do kits. An Albatros D.V in the same colors as the previous aircraft. Jasta 3 is the unit and again, Roden and Eduard for kits. An overall black Fokker D.VII from Jasta 7 is next. Both Roden and Revell make kits for this plane. Another S-S D.III in colors pretty much like the first option. Also with a wood fuselage is this Albatros D.Va from Jasta 84. Black and white rear fuselage. Kit by Eduard or Roden. Finally a Hannover CL.IIIa from Fl.Abt 226. This one is in overall mauve with random sections of Dark Blue and Green. For kits, Airfix is your choice. 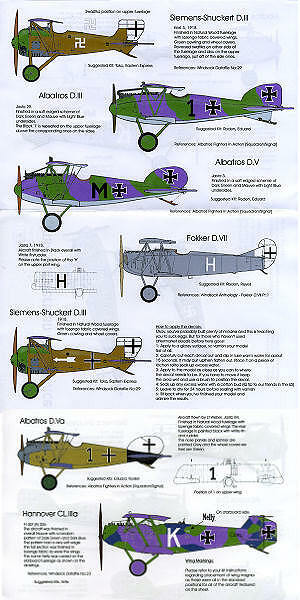 So there you have it, 7 great schemes for your next 1/72 WWI build. Options are there for those who want minimal rigging, which is always nice. Instructions provide information and full color profiles of each aircraft.